Ancient city in the Jordan valley, at present Der'at, southeast of Muzerib. The city is apparently mentioned as "Otara" in Egyptian inscriptions. 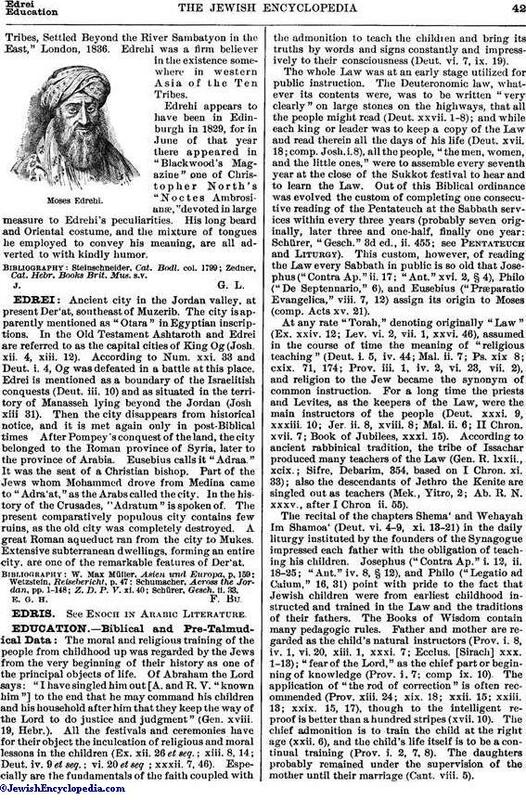 In the Old Testament Ashtaroth and Edrei are referred to as the capital cities of King Og (Josh. xii. 4, xiii. 12). According to Num. xxi. 33 and Deut. i. 4, Og was defeated in a battle at this place. Edrei is mentioned as a boundary of the Israelitish conquests (Deut. iii. 10) and as situated in the territory of Manasseh lying beyond the Jordan (Josh xiii 31). Then the city disappears from historical notice, and it is met again only in post-Biblical times. After Pompey's conquest of the land, the city belonged to the Roman province of Syria, later to the province of Arabia. Eusebius calls it "Adraa." It was the seat of a Christian bishop. Part of the Jews whom Mohammed drove from Medina came to "Adra'at," as the Arabs called the city. In the history of the Crusades, "Adratum" is spoken of. The present comparatively populous city contains few ruins, as the old city was completely destroyed. A great Roman aqueduct ran from the city to Mukes. Extensive subterranean dwellings, forming an entire city, are one of the remarkable features of Der'at.